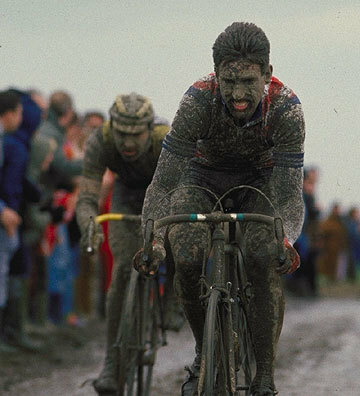 -An article about the Paris Roubaix race. First off, apologies for not having written in a while. We are currently (this is changing, soon) understaffed and so it’s quite hard to find time to write. Bare with us through the spring, we have at least two new hires coming down the pike to help us out, as well as a fantastic new head mechanic currently in place. So things should be back to the new normal soonishly. Winter fades. Frozen soil thaws, new life begins. The professional cyclist, who has let himself grow plump on two Coors Light beers and a victory burger, buckles down for a season of suffering and angst. The Spring Classics, relatively short races held across continental Europe, distill road cycling to a high proof essence. The races are brutish, filled with chance, crashes and mechanical failures. Often riders will crash multiple times in a single one day race. Bernard Hinault crashed 7 times in his only Paris-Roubaix victory. The final crash was caused by a small dog named Gruson. Dig around on the web. There are many back door ways to watch the Spring Classics, even though ESPN, ESPN 2, ESPN Poker, ESPN Classic, ESPN Snooker, and ESPN Bowling don’t cover any of it. I don’t have any links for you there, but they are out there, hiding in forums. Find some, and share them in the comments. The races are fun to watch, and almost always have exciting finishes. There is a slow, but interesting documentary on the race, called Hell of the North. It’s a long one, but show’s the whole enchilada, from the prepping of the mechanics to the showers in the velodrome at the end. Eddy Merckx more or less stars in it, and puts out this huge effort, way too late in the game. Shop Rides are gunna start up again. This week we’ll have just two, but soon we’ll have a good number up and running. Brian is starting his popular hill climbing ride this Wednesday. Meet at the shop around 5, and hit the road around 5.30. Fastish pace, but it’s a no drop ride, so if you like climbing, or want to get better at it, come on out. Ride goes till dusk, and mileage will increase as daylight permits. Tuesday morning, at 8 am, we’ll be heading out for an easy peasy road ride. Nothing major, nothing long. Maybe some dirt, maybe not. Sub 40 miles. Probably some coffee in the middle there. No set schedule, a good ride for a day off. We’ll be starting up more rides soon, stay posted. Winter Clinics are more or less finished for the season. We’re too busy to do them now. We’ll still do our free fix a flat clinic on the first Wednesday of every month at 6 pm. It’s comprehensive, so even if you know how to, say, put a new tube in, we’ll show you how to boot a tire or what to do if you run out of tubes. Got ideas for next years winter clinics? Leave ideas in the comment section. As most of you know, we’ve done a big refit on the shop. We now have a dedicated road and tri side of the shop, and are working on a good womens area as well. The season has been insanely busy, and there have been a few personnel shake ups, nothing bad, just changes. We got a new service manager, named Zach, who has gobs of experience: pro team mechanic, pro wheel builder for wheelsmith, trike maintenance guy for a huge industrial plant that used trikes to get around, lots of shop experience. He is fast, knowledgable, and really solid. We’re trilled to have him. He is going to be training John, who has worked with us on a part time basis for a while but is now full time, to be his second in command. John, for those who don’t know him already, is a long time cyclist who rides mountain, races cross, used to race road, and does a bit of lite touring too. He’s a PhD is evolutionary biology, to boot. Brandon tries to stump him with questions, but it doesn’t work. We’ll be joined shortly by Tracy, who is a local road rider with a ton of enthusiasm. She’ll be part of our growing sales team. Look for her out climbing Hamburg Road, her favorite local pitch. Our Grand Reopening is set for April 21 and 22. We’ll have food, drink, music, and things like that. An actual schedule to be emailed out later this week, but it should be good, and you should consider this an early warning/invite to keep that weekend free. Analog Photography, bike adventure, bike doctor in the world at large, clinics/shop events, Frederick Riding, Lots of Pictures for the Illiterati, Meaningless Quotes, Monster Climbs, new rad stuff, Things you should be into, Tiny Caps, Walking up hillsAnalog Photography, bike adventure, bike doctor, bike doctor frederick, bike doctor shop action, Brantonio Branderas, clinics, Cobbles, epic, Group Rides, Hell of the North, Hinault, Lugged Steel, Paris-Roubaix, Rooijs, what's your epic?